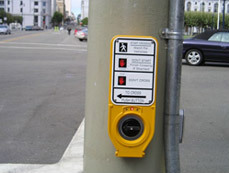 The May, 2009 issue of AccessWorld, published by The American Foundation for the Blind, includes an article about San Francisco Accessible Pedestrian Signals written by Lainey and Jessie Lorenz. Jessie is the Director for Public Policy and Information at the LightHouse for the Blind and Visually Impaired in San Francisco. You can read the AccessWorld APS article on the AFB website. The San Francisco LightHouse, along with the California Council of the Blind, the San Francisco Independent Living Resource Center, and individual blind advocate Damien Pickering, were the Claimants in the Structured Negotiations process that lead to an historic agreement with San Francisco in 2007. Lainey and co-counsel Linda Dardarian were the lawyers representing the blind community. The full APS agreement, the negotiated APS Technical Specifications, and the APS press release issued when the agreement was announced are available on this site. As a result of the APS settlement, San Francisco has now installed over 650 accessible pedestrian signals at approximately 70 intersections in San Francisco. Please contact us if you would like to share your experience using the San Francisco Accessible Pedestrian Signals or APS in your community.